How do you become an effective primary school teacher? What do you need to be able to do? What do you need to know?Flexible, effective and creative primary school teachers require subject knowledge, an understanding of their pupils and how they learn, a range of strategies for managing behaviour and organising environments for learning, and the ability to respond to dynamic classroom situations. The fourth edition of this bestselling textbook has been fully updated with the latest research and initiatives in the field, as well as the most recent changes to the National Curriculum across the UK. Twenty four new authors have contributed, sharing their expertise and experience as practitioners. Ten brand new units have been included on:Becoming a professional in the current context Building inclusive communities of engaged learnersUnderstanding schools' aims and enacting your ownTeaching for social justiceReadingGrammar and punctuationMastery in mathematicsThe value of outdoor learning Primary education in a digital ageA selection of extra tasks have been woven throughout, with an emphasis on innovative, reflective practice, and new `vivid examples' bring each chapter's argument to life in a classroom context. In addition, each chapter contains M-level tasks and further reading to assist with research assignments, and differences in the National Curriculum and policy in Scotland, Wales and Northern Ireland are highlighted. 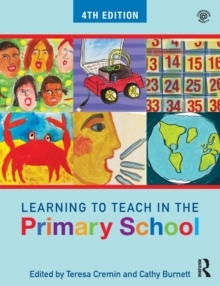 Providing a comprehensive but accessible introduction to teaching and learning in the primary school, covering everything a trainee needs to know in order to gain QTS, this accessible and engaging textbook is essential reading for all students training to be primary school teachers. This textbook is supported by a free companion website with additional resources for instructors and students (www.routledge.com/cw/Cremin) and an accompanying series of books on Teaching Creatively across the curriculum.